The only insurance carriers for sale on the individual market in Sedgwick county are Anthem BCBS and Colorado Choice (Friday Health). Anthem BCBS shows 0 providers based in Sedgwick county, so all doctors are traveling from out of the county, which drives higher costs. Most of the doctors for Friday Health would be traveling from out of the county too. They only show 2 providers based in Sedgwick county. Anthem BCBS has 0 unique providers in Sedgwick County. Anthem BCBS has 0 unique facilities in Sedgwick County. Anthem BCBS has 0 total unique providers + facilities in Sedgwick County. Bright has 0 unique providers in Sedgwick County. Bright has 1 unique facilities in Sedgwick County. Bright has 1 total unique providers + facilities in Sedgwick County. Cigna has 0 unique providers in Sedgwick County. Cigna has 1 unique facilities in Sedgwick County. Cigna has 1 total unique providers + facilities in Sedgwick County. Colorado Choice has 2 unique providers in Sedgwick County. Colorado Choice has 0 unique facilities in Sedgwick County. Colorado Choice has 2 total unique providers + facilities in Sedgwick County. Denver Health has 0 unique providers in Sedgwick County. Denver Health has 0 unique facilities in Sedgwick County. 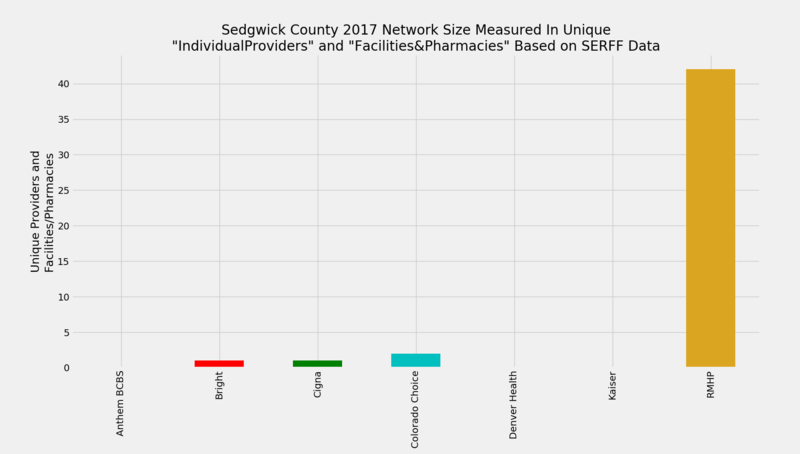 Denver Health has 0 total unique providers + facilities in Sedgwick County. Kaiser has 0 unique providers in Sedgwick County. Kaiser has 0 unique facilities in Sedgwick County. Kaiser has 0 total unique providers + facilities in Sedgwick County. RMHP has 39 unique providers in Sedgwick County. RMHP has 3 unique facilities in Sedgwick County. RMHP has 42 total unique providers + facilities in Sedgwick County.